The Captain's Suits are his weapons. Each one has a unique spedial technique that woill overpower, damage or stun the enemy - or alternatively, heal your allies. Use them according to your choice of agents and the mission's needs. Your Agents are your comrades in the fight agaisnt evil. Each mission, you get to pick two out of the four special agen classes, each with their unique abilities. Agent teams can compete in the ARENA - An Agent vs Agent training system where they are awarded scores based on their performance in simulated combat. The classes and tactics you choose will decide the outcome, so plan carefully. Team up with your fellow agents in shield squads! aside from participating in the special squad based events, you can also provide and receive extra medkits to and from your fellow agents. 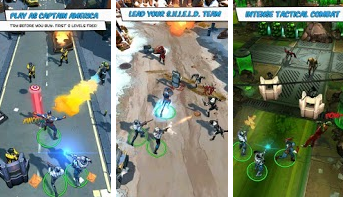 How to unlock all level for the Captain America: TWS Game?